Two of management accounting’s fundamental premises are that valid modeling is very useful and that Finance plays a leadership role within the organization. By applying these premises to the income statement, a new, innovative income statement can be developed. We refer to it as the operational income statement (OIS). The OIS involves optimization methods that are based on cause-and-effect relationships via modeling that seamlessly integrates operational data with financial information. 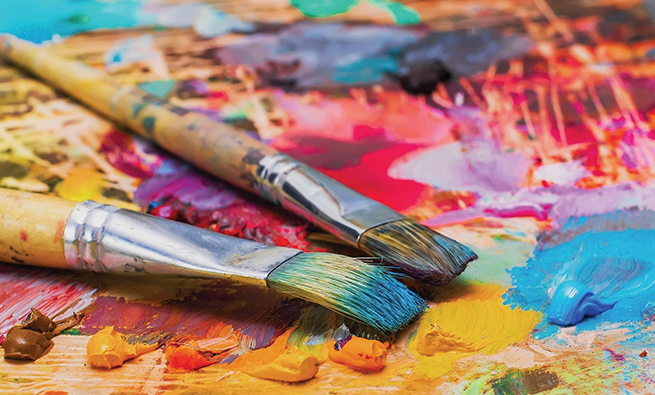 This gives the income statement—“the one report every organization needs,” according to Randall Bolten’s book Painting with Numbers—new life and practicality. The operational income statement requires the Finance function to shift from simply monitoring a company’s incurred actual vs. budgeted expenses to working closely and cross functionally with the Operations function to understand and, ideally, better manage the operations that caused those expenses. The OIS is created by integrating two commercially successful advanced analytic capabilities—predictive analytics and mathematical programming—into a single operational model. Applying these two analytic capabilities ensures significant operational and financial performance improvements. In addition, an OIS modifies the traditional budgeted income statement process, which will result in significant improvements to the entire budgeting process. A Wall Street Journal article titled “CFOs Wade Into the Trenches of Operations” by Kimberly S. Johnson. A Forbes article titled “The Rise of the ‘Operational’ CFO” by Jeff Thomson, president and CEO of IMA® (Institute of Management Accountants). A Financial Executives International (FEI) article titled “CFOs Filling the COO Vacuum” by Christopher Westfall. A CFO.com article titled “Double Duty” by David McCann. A CFO.com article titled “Why CFOs Should ‘Own’ Analytics” by Fred Friedman, former CFO and CEO of Deloitte. A CFO.com Special Report, “The Promise of Predictive Analytics” by Vincent Ryan. A CFO.com article titled “Finance Must Ramp Up Role as Analytics Leader” by Thomas H. Davenport and Adrian Tay. The application of the OIS will provide substantial additional support for these efforts. In this article we’ll explain the OIS’s significant performance improvements for Finance, Operations, and Sales and Marketing; how an OIS modifies and addresses issues with the current budgeting process; the OIS model itself; and how an OIS enhances the role of a CFO operationally. Think of a chief financial officer (CFO) performing as a chief operating officer (COO). The operational income statement is an example of a specific application of both principles outlined by Gary Cokins and Anton Van der Merwe in in “Enterprise Optimization,” published in the February 2014 issue of OR/MS Today. In their article, they describe two principles that summarize management accounting’s role in achieving enterprise optimization: the causality principle, which governs and assures valid cost modeling, and the analogy principle, which governs the uses of cost information to accurately reflect business activities or processes and leads to selecting the best decision among alternatives. An OIS employs both principles, which also are described in the IMA Statement on Management Accounting The Conceptual Framework for Managerial Costing, by Larry R. White and B. Douglas Clinton, published in September 2014. First, the OIS is a model based on cause-and-effect relationships. It describes and reflects the actual operations of a company. The model is created from the company’s operations, including its employee and asset work activities that comprise processes that cause the expenses reported in the traditional income statement. Second, the OIS employs the analogous uses of cost information. The traditional income statement’s line items are aggregations of the budget line items in the general ledger chart of accounts. These costs analogize (i.e., reflect) the company’s organization chart. The OIS line items reflect the operations that do the work of the company, such as procure, make, pick, and pack. The continuum of analytics has four stages: descriptive, diagnostic, predictive, and prescriptive. The first two are hindsight, and the second two are forward looking. Here we use the continuum’s third stage for costs within the model and its fourth stage for the model itself. It uses the word optimization prescriptively (What is the best possible outcome?) and not predictively (What will happen if we do X? ), which is the continuum’s third stage. The latter is frequently referred to in the trade press as a scenario or a what-if analysis. When a company can answer the “best possible outcome” question, a variety of enterprise performance management (EPM) benefits accrue for various types of organizational line functions. Creates the maximally profitable forecast. Integrates the executive team’s strategic plan with the annual financial plan. Typically their strategy is disconnected from a traditional budget. Maximizes the projected OIS profit opportunity of a proposed merger and acquisition (M&A) deal. Doesn’t disrupt or replace any of the enterprise’s currently installed operational and financial planning and execution software systems (e.g., financial planning and analysis (FP&A) and sales and operations planning (S&OP) software). Improves the forecast process and its results. Enables the creation of a flexible OIS that, just like flexible budgets, adjusts for changes in the volume of activity. This is useful for actual vs. budgeted cost variance analysis. Enables a strategic OIS to be developed using the same model structure as the annual OIS. This presumes that the company is comfortable with the accuracy of cost data in the strategic time frame and forecasts for the strategic time frame beyond a year. Maximizes the return on investment (ROI) of the expenditures by the Sales and Marketing departments. Designs the optimally feasible supply chain plan to make and fulfill continuously revised forecasts respecting sustainability constraints of energy and carbon emissions, if desired. Redesigns the strategic supply chain as a part of developing the strategic plan, thus making it truly optimal. 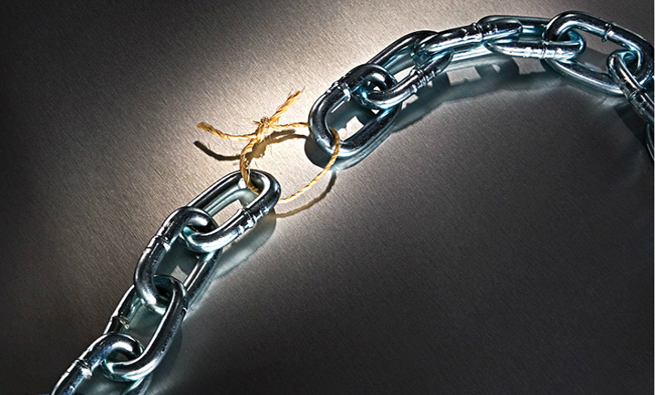 Most supply chain network designs are suboptimal because they assume a fixed forecast of product volumes. As explained in the Model section later in this article, the OIS relaxes this assumption. Thus the OIS supply chain is truly optimal because of the concept of suboptimization (i.e., the practice of focusing on one component of a total and making changes intended to improve that one component and ignoring the effects on the other components). Possibly provides an optimal solution for the vexing issues of stock keeping unit (SKU) proliferation and the omnichannel, a multichannel approach to sales that engages customers throughout their whole shopping experience. Is easier to build if the company has activity-based costing (ABC) data. 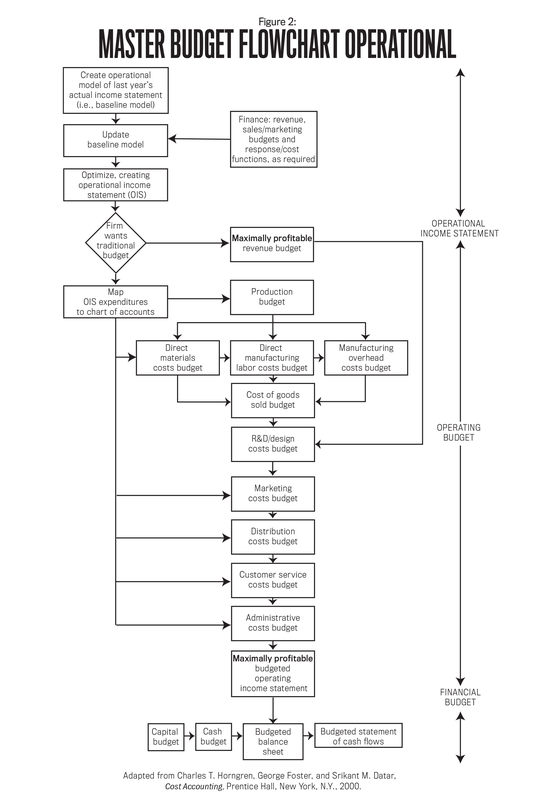 As illustrated in the master budget flowchart in Figure 1, the traditional income statement is developed from the budget beginning with the revenues budget (forecasted level of unit sales) as the starting point. Conversely, as illustrated in Figure 2, in the case of an OIS it’s just the opposite. The budget is derived from the OIS and is the ending point. That is, the budget’s expenses are dependent variables that are derived from operational independent variables, primarily quantities of sales volumes and mix demand. As Figure 2 also shows, the company will need to determine, with the advent of the OIS, whether the traditional budget and its associated income statement need to continue to be included in the financial planning process. As background to the decision of whether to continue with the traditional budget, the Beyond Budgeting Institute (http://bbrt.org) has been advocating abandoning the traditional budgeting process. In addition, Stephen Bragg’s book Budgeting, The Comprehensive Guide, third edition, has an entire chapter devoted to the subject. 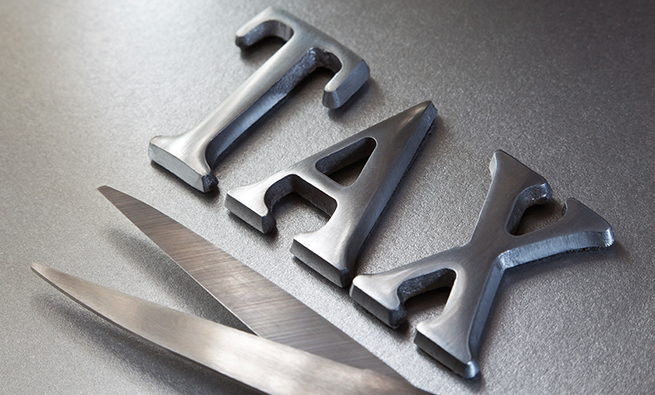 Should the traditional annual budget be retained? Let’s take a look at 10 issues with the current annual budgeting process as summarized from Bragg’s book. The information in italics shows how the OIS addresses these issues. All quotations are from Bragg’s book. “Line managers only annually submit their budget. As a result they are not that experienced.” Shown in the flowchart in Figure 2 are the steps involved in creating the OIS for the current year—last year’s OIS, appropriately updated. The updates required are a new sales volume and mix forecast and any changes in the model’s structure or to the enterprise response or cost functions. “Gaming.” An OIS would be difficult to game because all parties will have agreed on the analytics of the resources’ expense structure (e.g., changes in processes) and data it contains and consequently to the analytics of the result: the OIS. “The time required for developing and updating. 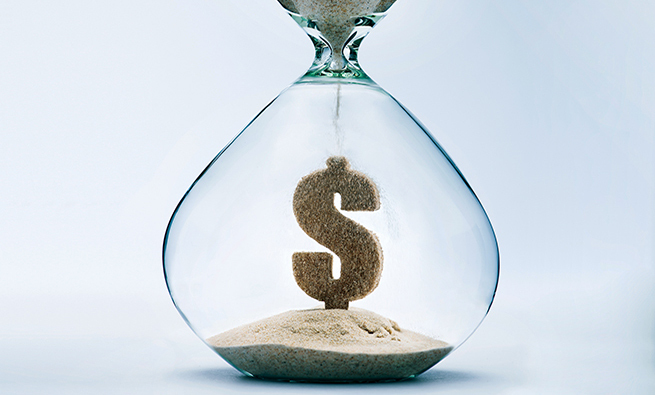 Are all of the expense line items in synch?” There is no time delay other than that required for item No. 1. “Becomes obsolete quickly. Actual-to-budget expense variances increase over time, which means the budget is ignored.” With an OIS, actual results can be entered at the end of each period and the model recalculated. This normalizes the OIS for actual results, creating much smaller cost variances, and is referred to as the flexible OIS mentioned earlier. “Always wrong since it is static.” If the business environment changes to any significant degree, all that’s needed is to update the OIS model for revisions to costs, forecasts, etc., and the OIS model is reoptimized. A new OIS is immediately calculated and available. This is one of the OIS’s most important advantages. It is created by calculating the model and not with an ad hoc budget updating process. “Connection with strategy?” As described earlier in the Finance’s EPM benefits section, the strategic and annual OIS models are variations of the same model. Expense allocations. “The budget may prescribe that certain amounts of indirect expense (i.e., overhead) be allocated to various departments, and the managers of those departments may take issue with the allocation method used.” An OIS doesn’t employ indirect expense allocations because the OIS operational input data doesn’t use allocations. Command and control system. “The single most fundamental problem underlying the entire concept of a budget is that it is designed to control a company from the center.” An OIS is a model, and the only possible corporate meddling is with the initial forecasted quantities. While the corporate headquarters staff can certainly override the model’s results, it seems unlikely they would do so since they have gone to the effort and time commitment of implementing an OIS. The Sales and Marketing budget is driven by forecast. 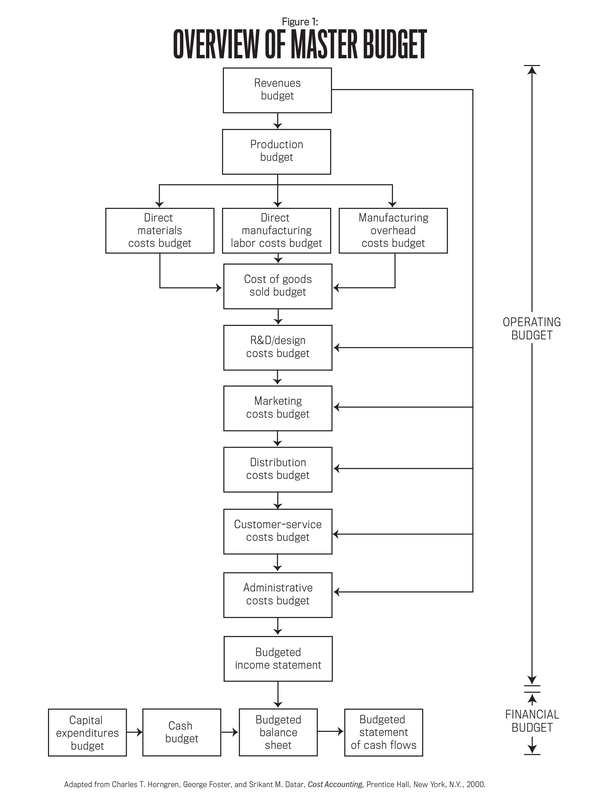 “Construct this budget after most of the other departments have completed their preliminary budgets.” For an OIS model, it’s the opposite, as shown in Figure 2. In summary, the two keys to a budget model are cost variability and constraint analysis. “If you [are] aware of both, then you will have an excellent understanding of how a company creates profit and how to structure a budget to show which actions or events will change profit.” The OIS model implements both cost variability and constraint analyses. Disaggregate the OIS results because customers and products have been aggregated for computational purposes. Map the disaggregated results back to the traditional budget’s chart of accounts line item detail. The OIS contains three cost elements: (1) all of the operations performed by the company, as described earlier; (2) the physical buildings within which the operations are performed; and (3) links connecting the buildings. 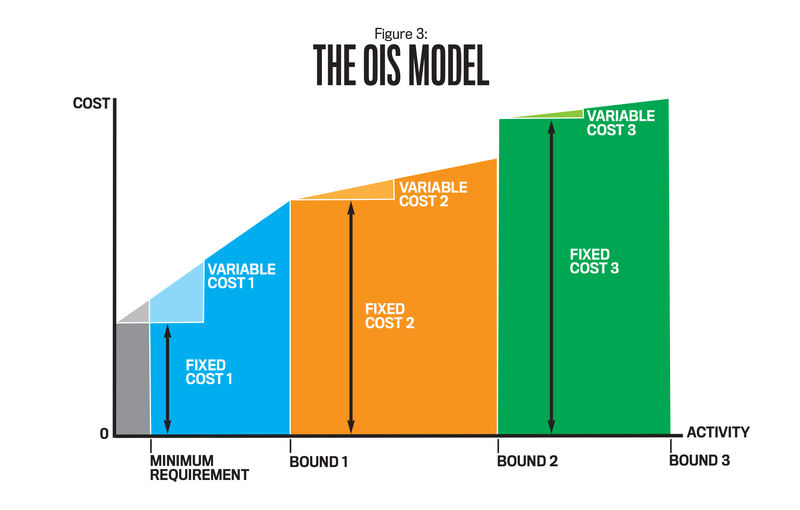 It’s important to note that since an OIS answers the “best possible outcome” question (in the OIS’s case, the most profitable forecast), then the costs of these three elements must be represented in the model as variables so the model can calculate and select the best outcome from all the possible solutions. The three cost elements are arranged sequentially in a prescriptive mathematical programming model. The input data for the three cost elements used in the OIS to represent the operations in cost of goods sold (COGS) and general and administrative (G&A) are referred to as cost functions. These elements form a mathematical relationship describing how costs (y axis) vary with changes in the operations’ quantities (x axis). See Figure 3. There are at least four ways for management accountants to work with Operations to create these functions: statistics, engineering data, accounting records, and, as was only recently used by progressive accountants, with activity-based costing data. The S of SG&A, sales, the final element of an OIS, is more complicated. These cost relationships are referred to as enterprise response functions. They are an OIS’s third use of advanced analytics and are also stage 3 in the analytics continuum—predictive analytics. Enterprise response functions differ from cost functions. Enterprise response functions reverse the x and y axis relationship of the cost functions. The independent variable, the horizontal axis (x), is the total Sales and Marketing expenditures, and the dependent variable, the vertical axis (y), is the quantity that those expenditures drive. Deriving the enterprise response functions often requires much more sophisticated analytics than the cost functions. As we discussed briefly, the amount of demand generated by Sales and Marketing expenditures is a function of many different factors: prior customer satisfaction with the goods, the amount and effectiveness of marketing, the level of competition, pricing and discounting, and external events (such as weather). Advanced analytic techniques, like those used for marketing mix modeling, are available to estimate the enterprise response functions, but companies will also need to have access to experienced practitioners who can build and validate these models unless they already possess the necessary data to sense (i.e., shorten the time to sense true market data) and then to shape (i.e., use techniques to stimulate market demand) the demand. Finally, unlike cost functions, which will bring the management accountants closer to Operations, enterprise response functions will bring them closer to Sales and Marketing. Further, as we described, since the enterprise response function’s dependent variable—cost—is the independent variable in cost functions, enterprise response functions drive the entire OIS model. Thus the Sales and Marketing expenditures are the cause that drives the impact on COGS + G&A costs. This is a reality that will elevate the importance of enterprise response functions in the annual planning process with Finance and Sales and Marketing expenditures at the helm of a company’s “ship of state,” always steering the company toward maximum profit and the other performance benefits described above. We need to emphasize a final point: The OIS works. A simplified model was created by a consulting firm using data from an ABC consulting engagement. Its results determined that the company had left 25% to 150% profit upside on the table. These results will be discussed in more detail in a subsequent article. “The one report every organization needs” is achievable by deploying an operational income statement. An OIS strengthens the CFO’s hand operationally. Again, think of the CFO performing as a COO and as leading the cross-functional advanced analytics effort. Implementing both management accounting principles for enterprise optimization: the causality principle and the analogy principle. Implementing two of management accounting’s fundamental premises: the usefulness of valid modeling and Finance’s leadership role within the company. True optimization: analytics continuum stage 4. In these times of ever-increasing competition, volatility, and an uncertain economic outlook, investigating and evaluating whether an operational income statement would benefit organizations should be an imperative. We believe it would constitute an enduring competitive advantage. NOTE: In a follow-up article, the authors will illustrate the analytic operational inadequacies of traditional accounting and show how to create and use an operational income statement. Meanwhile, they would look forward to discussing possible next steps with any reader. I have always been interested in optimization. My 1971 Cornell University degree was in operations research and industrial engineering. My observation back then was that students who pursued an operations degree possessed not only an innate interest in improving processes but also in determining the best process. This instinctive desire to fix processes really annoys my wife and friends. It apparently involves a personal psychological need to want the performance of anything to be the best that it can be. 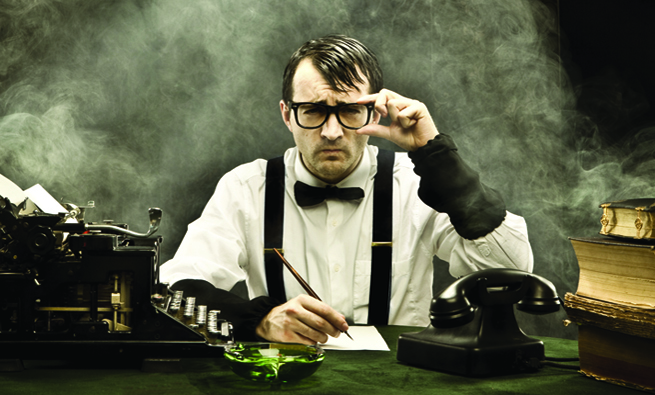 Many accountants are satisfied with providing good reporting. My interest in OIS is for accountants to not stop at simply good reporting but to expand to providing relevant and effective information to support better decisions. As a member of a current IMA task force that is advocating progressive management accounting methods and practices, I’m developing a “stages of maturity” framework that organizations can use to determine which stage their management and accounting practices are at. In it, the highest stage for the predictive view of accounting is optimization. I’m inspired by the analytics community of data scientists. Until recently they described a continuum of analytics with these three levels: descriptive, diagnostic, and predictive analytics. (The title of my coauthored, Wiley-published 2015 book is Predictive Business Analytics.) But a fourth level has now been added. It is prescriptive analytics, which is synonymous with optimization. I have always been interested in analytics. My 1961 Cornell University degree was in engineering physics, and my University of Michigan MBA was in quantitative methods. During my 30+ years with IBM, I experienced a variety of opportunities to apply analytics in a business setting, including the application of prescriptive analytics to determine the best supply chain design. After IBM, I joined a supply chain consulting firm. During a traditional supply chain design engagement with a white goods manufacturer, one question wouldn’t go away: Why was it necessary for the forecast in the supply chain design model to remain fixed? Mathematically, the more variables that are in play then the better the solution. And so my OIS journey began. Three developments were particularly important during the journey to OIS. The first was my discovery of a robust prescriptive technique for sizing and allocating sales and marketing resources. This technique relaxes the assumption of a fixed forecast. The second and third appeared more recently: two emerging trends documented in the financial trade press that suggested that Finance should have primary responsibility for cross-functional analytics and become more involved with Operations. What has emerged with OIS is an opportunity for Finance to drive unprecedented performance improvements, including the ability to develop the maximally profitable forecast, all made possible because the assumption of a fixed forecast was dropped. Alan Dybvig is the managing partner of Dybvig Consulting. His intellectual property was implemented to create OIS, http://operationalincomestatement.com. His business experience includes 32+ years with IBM as a director and senior manager, primarily in supply chain and sales/marketing assignments, and then four years with a Warburg Pincus-financed supply chain startup where the idea for OIS germinated. He also has had five articles published in the Journal of Corporate Accounting and Finance. You can reach Alan at (609) 947-2565 or alan@operationalincomestatement.com. Susan, i got the following answer from my partner responsible for developing the enterprise response FUNCTIONS. “I have not done any work for non-profits, but I believe that we have done some pro-bono work as a company. The general principles of impact measurement and optimization still apply, but you often need to change the objective function since the primary goal is generally not sales. There are some additional challenges on the data side since there is great use of Public Relations, which is not tracked as well as promotion where there is a direct cost.” if you’re near princeton, nj he’d be happy to discuss pro bono possibilities.